Today, work is a problem: low wages, precarious employment terms and conditions, even the supposedly best jobs overwork us and make us miserable. Are there alternative states of affairs indicated by the history of work? Work is a ‘global history of working conditions and labour relations in human society’ (1). Moreover, it is Komlosy’s contention that ‘we are faced with the challenge of developing a new conceptual basis for debates on the future of work. This book is a contribution to those efforts’ (4). But, I wonder, can labour history generate conceptions of work that solve its problems today? And today isn’t human work itself precarious, under existential threat from new technologies? Komlosy rejects ‘the notion of a linear, progressive sequence of modes of production, along with the conception of work that such thinking would entail’ (1). This is important in not ruling out returning to conceptions of work that utilise pre-industrial, for example, thinking about work, practices and thinking that have ‘served people’s survival and self-discovery’ (1). So, Komlosy introduces two important themes that run throughout the book. One, that historical analysis should go beyond work organised in factories and to places where, especially outside Europe, they played little or no role; and two, that the concept of work should be understood in terms of the personal fulfilment of workers rather than just as labour per se. The author notes that only after 1900 did ‘the narrowing of the conception of work to gainful employment outside the home finally become dominant on a global scale’ (3). Because of this, value creation linked to other activities was ignored. But since the 1980s ‘the debate over what constitutes ‘work’’ has been blown open by the ‘flexibilization of labour relations’ (4). A ‘global precariat’ has begun to emerge; and global corporations have rolled back social conceptions of work built up variously in social democracies and by communist parties (4). Chapter 1, ‘Terms and Concepts’, structures the whole book. It is argued that there’s a ‘Eurocentric grand narrative’ about work that has ‘limits’; and that there are alternative narratives of work, especially ‘the global-history perspective’ (7). The Eurocentric narrative is, despite ‘highly divergent social and political points of reference’ (from conservatism to Marxism), a ‘shared conception of work linked to commodity production, value creation and exchange value’ (15). Other work, in this narrative, is understood as either subsistence or domestic, merely a part of our natural existence or work natural to women (15). Work is connected to commodity production and more people separated from the means of production, living urban, proletarian and industrial lives (15). ‘At the turn of the 19th to the 20th century, wage labour and gainful employment became the central sources of survival, personal identity and social mobility in industrialized countries’ (16). This all amounts to a ‘flattening of the concept of work’ (16). The Eurocentric narrative extends to labour organisations and their calls for ‘job creation and full employment’ that conflate work with the flat view (16). So too women’s movements’ calls to end exclusion and discrimination contribute to the ‘consolidation of the [flat] conception of work’ (16). Komlosy notes this to be true also of ‘national-liberation movements and independent post-colonial governments’ , which adopted the inherited concept of work in their efforts to accelerate economic development (16). Komlosy then considers the limits of the Eurocentric story. She argues it falsely focuses on European countries as ‘the global core’ with an assumed universal validity and ignores influences from outside Europe (18). The narrative has destabilized in the last quarter of 20th century; and the concept opens up because of digitalisation, relocation of mass production, and deregulated labour relations (18). So, Komlosy notes ‘ongoing discussions since the 1980s’ about how work could be ‘freed from its economic corset’ (18). Komlosy then introduces the ‘global history narrative’. She states: ‘the growing economic weight and self-confidence of non-European industrialized countries has stimulated curiosity in discovering their own economic and cultural traditions’ (20). This encourages a scholarly mission to study all regions and cultures. The value of ‘anthropology, global economic and social history, and the history of religion’ is attested in this mission (20). The global narrative rejects national-historical explanations and abandons the idea of ‘wage labour’s linear establishment’ (21). 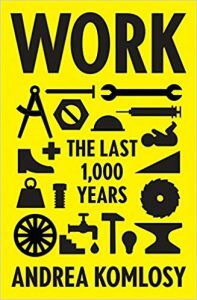 Komlosy’s analysis of work within this broader conceptual context – of positive notions and global narratives of work – is structured around six historical epochs defined by representative years: 1250, 1500, 1700, 1800, 1900 and Today. While it makes up the bulk of the book, the analysis for each year/epoch is, perhaps necessarily, fairly broad brush. While Sven Beckert’s detailed analysis of global capitalism, for example, runs to 600 plus pages, Komlosy’s ‘1700’ and ‘1800’ on ‘large scale connections’ each contribute four (146-150 and 168-172 respectively). This is a quibble in the context, at least of Komlosy’s aim to give some general historical ground to changing the way work is conceived now. In any case, her account of work ‘Today’ carries the heaviest burden of fulfilling the promise of directing thinking about the future of work. It starts with a familiar overview of industrial economies based on ‘regular gainful employment and social services’ (198). That is, it highlights that their growth was ‘driven by the ongoing commodification of an ever-increasing number of social needs’ (199). Komlosy characterises our post-industrial world in three features: 1) the erosion of job security and secured social rights; 2) flexibilisation and use of subcontractors; 3) outsourcing work to locations ‘more willing to fulfil companies’ demands’ (203). She argues that in this world ‘Today’ politicians can no longer regulate labour relations and working conditions but are reduced to marketing their country to ‘draw the largest investments possible in their respective countries’ (203). As a result, ‘working conditions and employment biographies are now highly fragmentary’ (203). Komlosy suggests this has left ‘five work characters’: 1) the remaining classical workers and office employees; 2) the post-industrial upwardly mobile; 3) stagnating precarious pieceworkers or temporary workers (the ‘most prevalent work characters’); 4) foreign migrant workers; and 5) those dependent upon charity or unemployment and social assistance (204). Komlosy further notes that with the first group being ‘sent into extinction’, the social base upon which trade unions build their negotiating power seems eliminated; especially so since the second group has no interest in union activity (204). Komlosy, shifting focus, notes too that smartphones and wireless internet (and the personal consumption and management they entail, like doing your own banking) control ‘every aspect of life, leaving absolutely no time for workfree free time’ (210). So here we have, in terms of Komlosy’s analysis, the worst of both work worlds: labour without even the compensations won by trade union actions and a new digital technology that fools us out of even the rest after labour. She calls this world of online activity ‘do-it-yourself shadow work’ and the people it produces ‘glasene Menchen’ (‘glass people’) (211). We ‘transparently carry on our shadow work’ (211). Ending with this chastening picture of workers today, toilers and 24/7 digital puppets, what hope of countering this? Komlosy suggests ‘a reactivation of subsistence spheres… potentially allowing certain areas to escape the functionalization demanded of them by capital accumulation’ (225). So, does global history throw light on that suggestion and moreover indicate positive ideas of work today? Work is perhaps best used as a primer in global labour history; and in that respect at least confirms that models of good work are not found generally in the six key periods Komlosy examines. Work and the global narrative provide largely a negative account of work. But then a full conception of work requires a history, of sorts, beyond even Komlosy’s global perspective, beyond paid employment and other labour and European views. Her reference to appealing to the history of religion (cited above) in broadening the outlook on work is perhaps indicative of a failure to see that good work is and has been a real experience of some workers (rather than just some moral-religious aspiration). There is then, I think, another global history of work that is more likely to challenge today’s problem of work with positive conceptions of it. It is a history of making that includes making artworks and accounts of good workmanship and design of things of everyday use. Guy Standing’s (2011) seminal description of precarious work includes its experiential sense of purposelessness: no sense of career, no sense of work identity. He also briefly notes William Morris’s much earlier recognition of a contrast between such ‘useless toil’ and the possibilities for ‘useful work’. Morris’s accounts of useful or good work had an historical basis in Gothic architecture and its associated arts and crafts. But Morris also argued that creative labour was possible in making anything with form, so that he thought anything made could be, in short, ‘Art’. This idea of ‘Art’, including skilled workmanship and good design as well as making artworks, seems a better ground from which to construct a positive conception of work. And it retains economic and social implications about how work is best organised at large. For there to be creative labour, there must be both skill and a desire to make something oneself; this requires a worker having control over what is made and how things are made, control over production in other words. It is this which gives Morris’s history and account of good work its vitality in ‘debates about the future of work’. The challenge it presents today is how the general demand for ‘Art’ in making is met in a world of robotics and related technologies: where is the place of good work? Is it really only in ‘subsistence spheres’, as Komlosy fleetingly suggests? The aim of global labour history is modest and laudable in so far as it’s concerned with broadening the base of labour research away from a Eurocentric focus. But the grander claims by Komlosy that it also offers a new, positive content to the concept of work is not met. Global labour history at least provides a negative account of work that serves as a contrast to the positive concept of work that Komlosy hankers for; but that rounded and aesthetic account is only available from other sources, notably still from the long human history of creativity, of making things well.